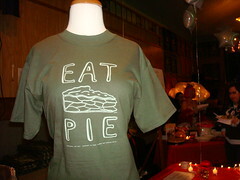 Did you know that January 23rd was National Pie Day? 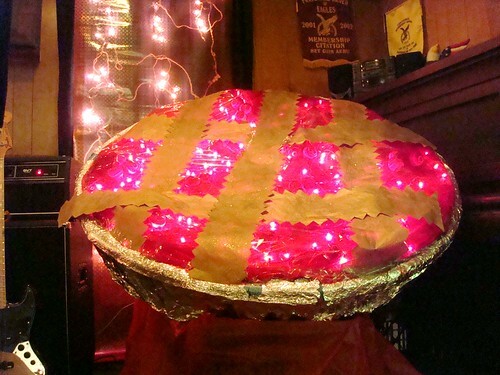 Now, some may argue that the day to celebrate pie ought to be March 14th. Unfortunately, these math nerds missed out on the cool-kid party we attended last Friday: a no-holds barred, absolute pie love-in, the likes of which we'd never seen. 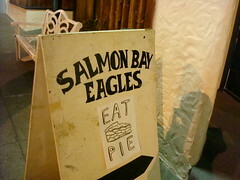 It was held at the Salmon Bay Eagles Hall in Ballard, Seattle; while the sign said FOE, the sandwich board definitely let on that PIE meant FRIEND. 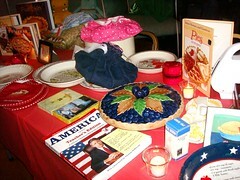 Inside, a veritable pie nirvana awaited, including music ("American Pie", anyone?) 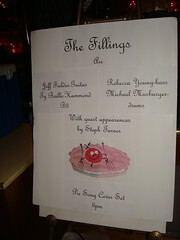 by our new favorite band the Fillings; EAT PIE t-shirts (designed by Christine Larsen); ginormous glowing pie sculptures; a projector screening various pie imagery, and of course, a delightful table of raffle prizes (including Cakespy artwork!). 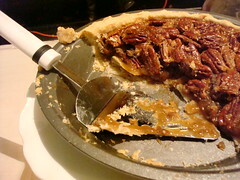 But of course, truly, the Pièce de résistance was the pie buffet: a series of tables set together in a line, it must have been over 30-ish feet long, with every type of pie you could ever dream of, both sweet and savory. We ogled over and sampled sweet varieties such as coconut cream, lemon chess, blueberry, marionberry, bourbon pecan, and more; even though we don't usually foray into savories, the Veggie Frito pie does deserve at least a mention. 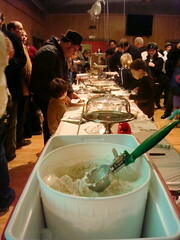 In a stroke of what can only be described as sheer brilliance, a large tub of vanilla ice cream (donated by Molly Moon) was positioned at the end of the line, a sweet gesture for those who preferred their pie à la mode; nearby, a station with milk and coffee offered accompaniments, but of course the cool and over 21 crowd could go to the adjoining bar area. 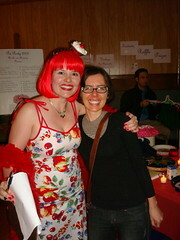 Of course, even sweeter than the pie was the mission: proceeds from raffle ticket sales went toward The Marsha Rivkin Center for Ovarian Cancer Research. 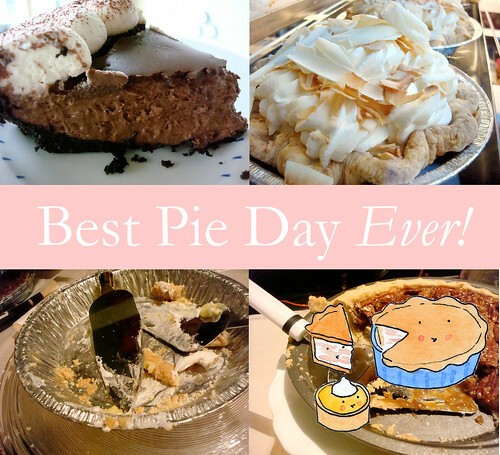 Seriously, words cannot really convey the true awesomeness of this Pie Day event. In honor of the day, here is the offering that Head Spy Jessie made to the Pie Buffet: Cup-pies so dense and delicious, they'll knock your socks off (or rot your teeth out, either/or). Though the white chocolate version is shown, we brought the dark chocolate variety to the party. Preheat oven to 450. 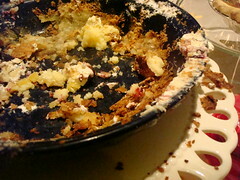 In a bowl, combine flour and salt; cut in shortening until crumbly. Gradually add water, tossing with a fork until dough forms a ball. Roll out to desired thickness (maybe slightly thinner than you would for a regular-sized pie) on a floured surface; either cut with a biscuit cutter or round cookie cutter (or just eyeball it and cut with a knife, you can shape it later) to about 2.5 inches across; press into cupcake cups and with fingers, shape to fit (I found this works best with silicone cupcake cups, which are sturdier than paper variations). 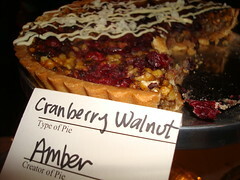 This amount will make anywhere from 8-12 cup-pies, depending on how thick you like the crust. Bake for 8-10 minutes or until slightly browned on the edges. Microwave chocolate and whipping cream in medium bowl on HIGH for 2 minutes or until chocolate is almost melted, stirring every minute. Beat with wire whisk until chocolate is completely melted and mixture is well blended. 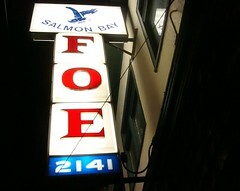 Add the 2 tbsp. of peanut butter; mix well. Spoon into prebaked (already cooled) shells. Refrigerate let cool; refrigerate for a couple of hours before serving. Note: You may have extra filling, depending on how thick your crusts are. If so, it's...um...delicious by the spoonful. 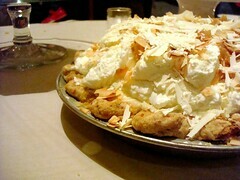 For more info on all things pie, visit piecouncil.org, or to get in on the argument over holiday's date, visit The Stranger. 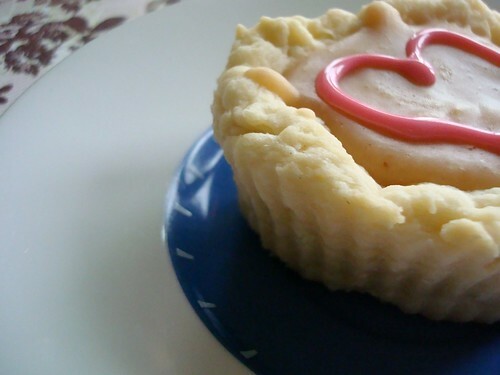 Though it's not been active for some time, the Mini Pie Revolution has a lot of cute ideas too.